Roll up your sleeves! Our River Cleanup Program mobilizes hundreds of volunteers to remove tons of garbage from the river each season, from April through November. 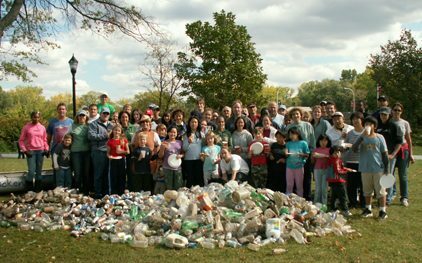 From New York State down to Newark Bay, Hackensack Riverkeeper organizes monthly Community Cleanups in different towns along the watershed, providing stewardship opportunities and spreading the message of a clean Hackensack River. River Cleanups are an important part of our mission to protect, preserve, and restore the Hackensack River Watershed, and could always use more help! At River Cleanups, volunteers can either comb the banks of the river for trash, or board canoes to collect floatables (conditions permitting). Hackensack Riverkeeper brings all the materials needed to get the job done: bags, gloves, and pickup sticks; canoes, paddles, and PFDs (personal flotation devices); hip waders, nets, a water cooler, and pizza. Volunteers need only dress for the outdoors, wear sturdy shoes, and bring bug and sun protection. Reusable water bottles suggested! To get started, review the list of upcoming River Cleanups, and consider registering for one (or more!). Individuals, families, and small groups are welcome. There is no minimum age to participate, however we do ask that all children be supervised, and that only adults paddle our canoes. Got a really big group? Consider coordinating a sponsored cleanup with our outreach coordinator, Caitlin! If your group (Scout, school, civic group, company, etc.) would like to sponsor a cleanup on a date and location of your choosing, we are happy to coordinate one with you! We are also actively seeking Community Partners to sponsor our monthly cleanups with the community. For more information on the River Program, sponsorship, a particular activity, or if you have other questions, please don’t hesitate to call Caitlin at 201-968-0808 or email Outreach@hackensackriverkeeper.org. Thanks, and hope to see you at one of our river cleanups! See you on the river! Click through for more info and to register. More cleanups/registration coming soon! *Indicates canoes will be used at cleanup. All cleanups have a shoreline component.